In its ongoing fight against illegally posted signs, the Woodhaven Residents' Block Association has asked two of its elected officials to support changes to the law. The changes would allow private citizens' testimony to be used in prosecuting those who visually pollute our neighborhoods by posting unsightly advertisements on telephone poles, lampposts, and other public property. The Block Association has been informed by the Department of Sanitation that if a private citizen removes an illegal sign, Sanitation is unable to prosecute those responsible for the signs. Only a sworn statement by a trained officer of the law, such as a Department of Sanitation officer, would serve as adequate evidence. 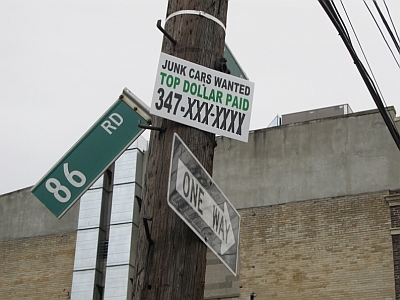 Unfortunately, the Department of Sanitation cannot remove signs as quickly as private citizens can, and every hour that an illegal sign remains visible is an incentive for unscrupulous businesses to flout the law with their eyesore advertisements. So the Block Association has sent a message urging its City Council Member Eric Ulrich and its State Assemblyman Mike Miller to pursue legal changes that would allow private citizens to tear down signs, and then provide testimony, sworn statements, and photographs to aid prosecution of whoever is responsible for the signs. "It is a win-win policy to allow citizens to remove illegal signs without invalidating any potential prosecution of the lawbreaking companies," the Block Association's letter states. "It empowers citizens, relieves the Department of Sanitation of some of the burden of enforcement, diminishes the incentives companies have to break the law, and leaves intact the chance to pursue legal recourse against law-breakers." There is precedent for this type of law. The New York City Administrative Code specifically states that sworn statements or testimony by private citizens might be useful in prosecuting illegal dumping. But there is no similar provision for prosecuting illegal posting. There are laws at both the city and state levels prohibiting illegally posted advertisements, so legal changes could be pursued by both our city and state representatives. "Illegal signs blotting our neighborhood are a growing problem, and the WRBA has been fighting them for well over a year," said Alexander J. Blenkinsopp, the Block Association's communications director, who wrote the letter on behalf of the organization's board of directors. "But the problem will persist, because tearing down signs is only a temporary solution. We need our elected officials to work with us on a longer-term solution: changing the law to empower our residents." Miller and Ulrich held an event last week to call attention to the problem of illegally posted signs, so they are natural partners to work with the Block Association in pushing for these legal changes. "The Block Association has been relentless in tearing down illegal signs. We have a zero-tolerance approach," said WRBA President Edward K. Wendell. "But we need the law to be on our side. We applaud our local representatives' willingness to recognize this problem in our community, and we hope that they -- and other lawmakers -- will help make this commonsense change we're suggesting to preserve our neighborhood's character." The entirety of the Block Association's message to Miller and Ulrich is available here.